Since missing data can occur on either the item score or on the total score, missing data methods can be applied on each of these levels as well. Some methods are designed especially to handle missings on the item level and other methods can be applied to either level. 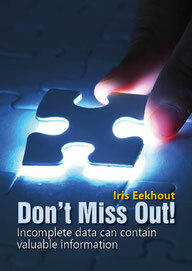 In order to include as much information as possible to obtain an optimal level of precisions in estimates, it is most beneficial to apply a missing data method to the item scores (Eekhout et al. 2013). Questionnaire manuals often advise to apply mean imputation, however these methods often produce biased results, especially when the missing data are not MCAR. The advanced methods tend to perform better and for incomplete item scores, these methods should be applied to the item scores. So a study has total scores as a main focus, but these are incomplete due to missing item scores, it is advised to apply multiple imputation to the item scores prior to calculating the total score and performing the analysis. In the video below you can see the information included to do the imputations in applying the method to the item scores versus applying the method to the total scores.